Hyundai Motor unveiled the eighth-generation new Sonata on Wednesday with drastic design changes and a “smart” engine. 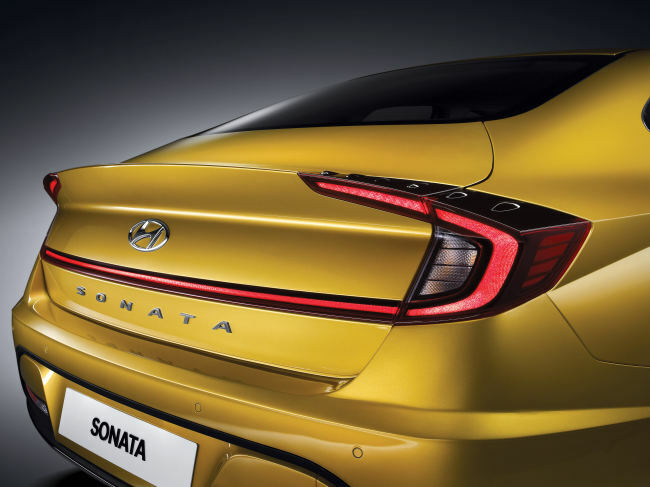 The Korean automaker said the new Sonata’s design, dubbed Sensuous Sportiness, was inspired by last year’s Le Fil Rouge concept that was first unveiled during the Geneva Motor Show. The new Sonata’s change can be recognized from its exterior design, the carmaker said, which has adopted a coupe-like frame, sloping roofline and low deck lid to make the body look longer. For the first time, the new Sonata uses hidden lighting lamps, which look like chromic material when switched off, but dramatically lit when turned on. The new Sonata’s interior also offers a high-tech, premium feel in the front seat as it was inspired by a Stealth aircraft, the company said. Drivers can also use their smartphone-based digital key by downloading a mobile app to simply unlock and start the vehicle. The gasoline 2.0 model runs on G2.0 CVVL engine, tuned to deliver 160 horsepower and 20 kilogram-force meters of torque. It is about 10.8 percent increased fuel efficiency compared to the previous model. Sales of the new Sonata will start this month, available in eight different exterior colors including white creme, shimmering silver, nocturne gray and four different interior colors such as black and camel. The price begins from 23.4 million won ($20,729) and goes up to 32.8 million won for the highest trim for gasoline model.